Things that I love — baking, eating, shopping and shopping, not necessarily in that order! Happy Friday, you guys! 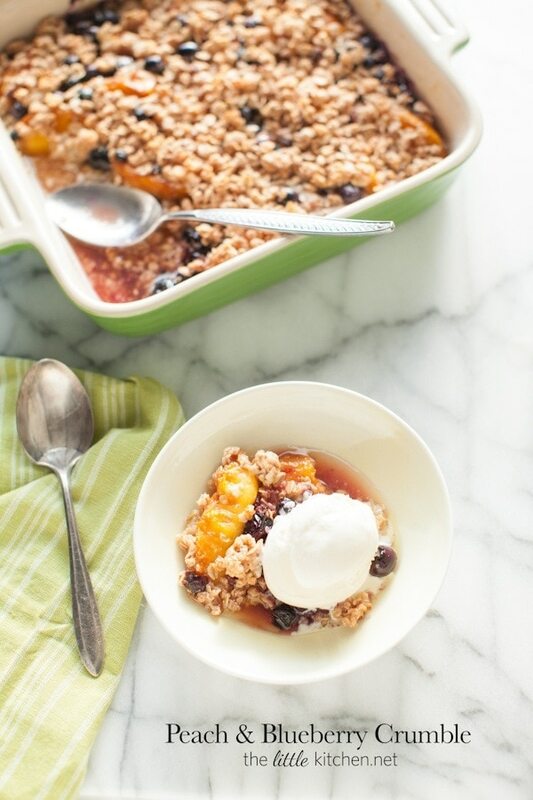 I’m excited to share with you this peach & blueberry crumble that only takes minutes to put together and my recent shopping experience at Marshalls. They sent me a gift card to go shopping and I had a blast! First, is the mise in place. I get all of my ingredients out and start working. 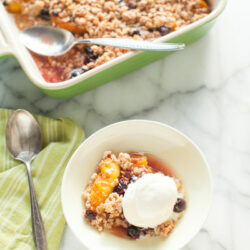 I had frozen my super ripe Harry & David Oregold peaches that I received a couple of weeks ago. If you’re using frozen peaches, run the baggie under cold water so you can break them apart. At the last minute, I decided to add lemon juice and zest…to give it a little different zing in case it’s overly sweet too. I have to tell you the story of these shoes. Most people who know me, I’m a t-shirt and jeans girl, no make-up, super laid back about fashion, sometimes I blow dry my hair, most of the time not. But last year, I decided I wanted to start wearing make-up and I actually enjoy wearing it…not putting it on and figuring out what the heck I’m doing but I enjoy it when it’s all done. I signed up for stitch fix and I have been trying my hand I getting a little more dressed up lately. A couple of months ago, I was at Marshalls and these shoes stopped me dead in my tracks. 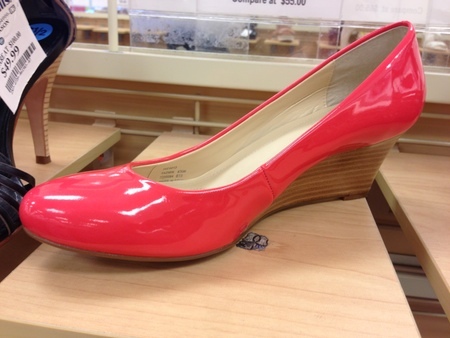 I have a pair of red shoes (they are flats btw) but I have never owned a pair of pink/coral shoes…these are SO NOT ME. But they are me, I fell in love and had to have them! The box with my size had two left shoes in it, I asked an employee to help me and he was able to find the matching pairs and I went home with my purchase. Knowing full well, I needed to find clothes that go well with these super fun shoes! I told you earlier, that Marshalls sent me a gift card, they had no idea of my obsession with their store nor my pink shoe purchase haha! 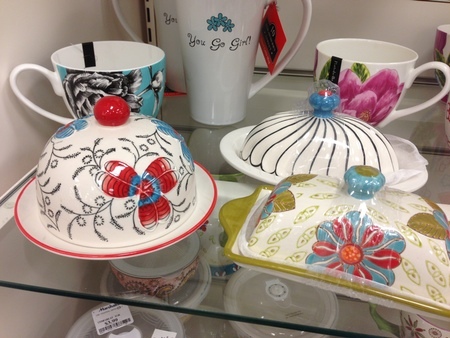 Aren’t these butter dishes cute? So this is what I came home with! Jar glass mugs that have a chalkboard finish on them so you can write names or whatever you want on them, fun glasses that were only $1.99 and tons of Le Creuset items that I will use over and over again. Photo by Julius, thanks for taking this photo of me! And then this dresss, when I saw it on the rack, I knew I had to have it! It’s a Calvin Klein Jeans dress, the material is very light and is supposed to look like jean material. I added a glittery skinny belt I bought on super clearance last year, to give it a little shape. My number one criteria for a dress is I must feel comfortable. I literally own 5 dresses that I never wear because every time I put them on, I want to tug or pull or hide in a trench coat. I’m starting to get into dresses more…because I’m starting to finally find ones that are comfortable and I feel comfortable in! …and do you see my fave shoes again? 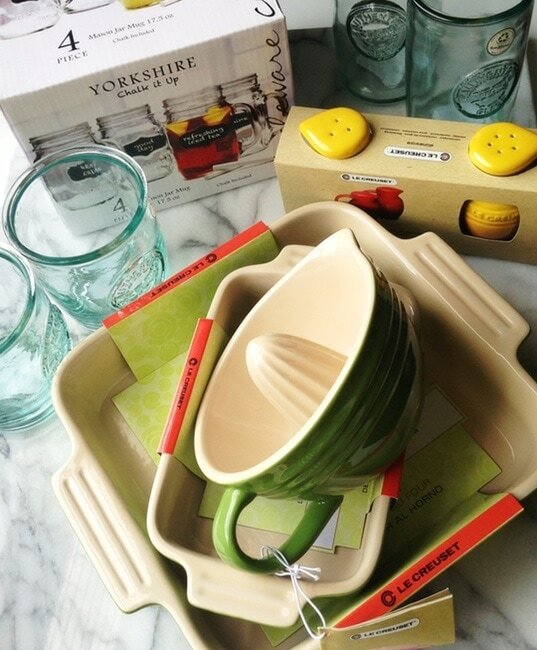 The dress, the kitchen gear — all $100! It might have been $103 but still, a steal! Thanks to Marshalls for feeding my kitchen goodie/prop obsession and now my new pink shoe obsession. PS and by the way, I’m fumbling my way through fashion so forgive the super awkward arm on waist pose. I have NOOOO clue what to do with my hands in pictures. 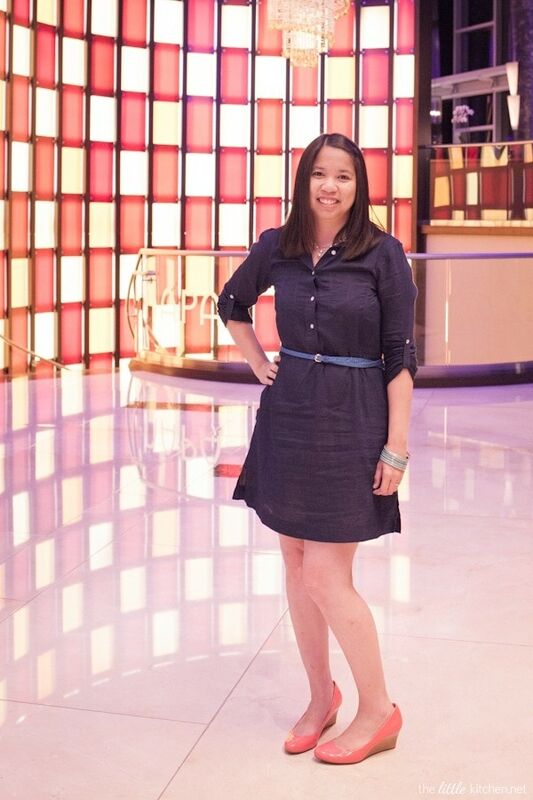 Sorry for the slight diversion to shoes and a dress…that I’m in love with. Back to this crumble. Make it okay? And enjoy the weekend!! What are you doing this weekend? 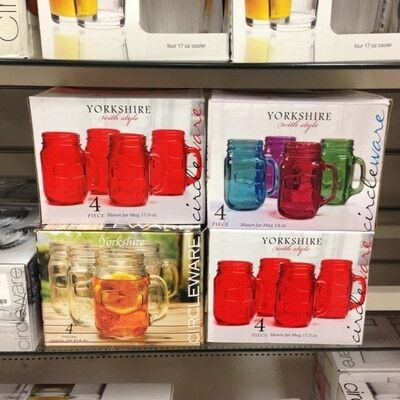 And while you’re at it, I would love to hear the best steal you have gotten at Marshalls…spill it! 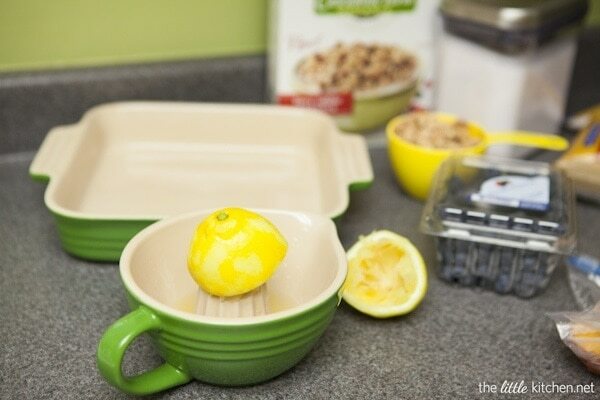 Mix 3 tablespoons melted butter, brown sugar, granulated sugar, vanilla extract, lemon zest and lemon juice together in a medium mixing bowl. 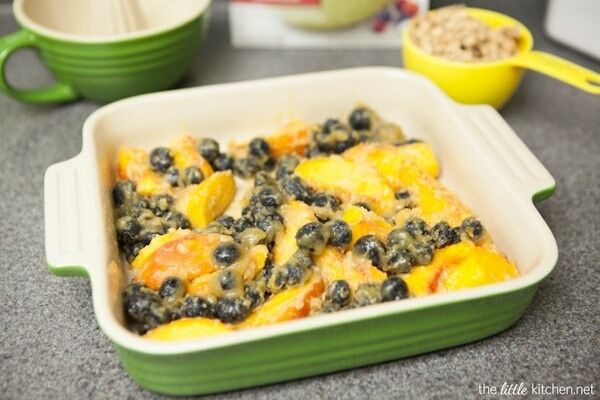 Add peaches and blueberries. Mix to combine. 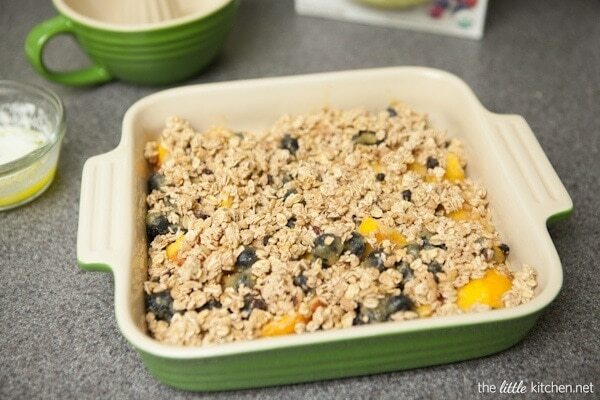 Pour into a baking dish. 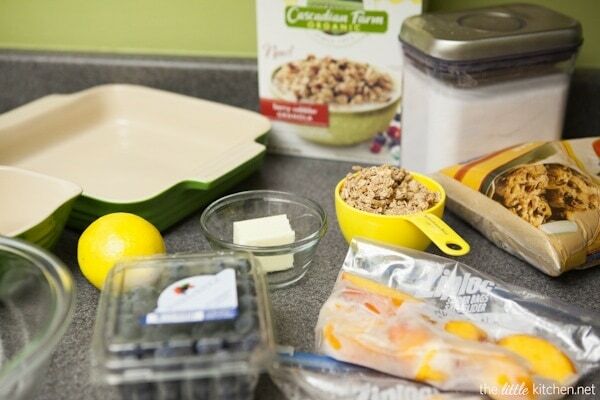 Top with granola cereal and the remaining melted butter. Bake for 25 to 30 minutes. Allow to cool for about 5 minutes. Serve warm topped with vanilla ice cream. 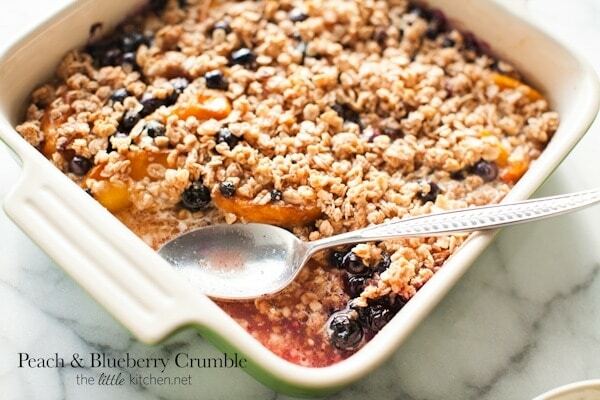 Crumble can be stored in the refrigerator for 1 to 2 days, reheat so it's warm before serving. Disclosure: I have received free products or value from Marshalls or The TJX Companies, Inc. in connection with my affiliation with Marshalls Project FAB. I also received free samples from Cascadian Farm. All opinions are my own and I only work with and mention brands that I love. There is a referral link in this post. I use a plugin for affiliate links so there may be other affiliate links, y’all, just FYI.